Soil improvement for making the existing growing soil better. Peat – neutralised with dolomite flour and enriched with mineral fertilizers. Horse manure compost – the rose soil contains floral nutritional compost biotechnologically made of horse manure. Ensures a suitable microbiological mix for plants. Biohumus or vermicompost – manure worm compost. Adds vitamins, growth regulators, amino acids and a beneficial microflora to the soil. Clay – binds water and prevents the soil from drying. Sand – ensures consistent structure of the garden soil and favourable humidity and air regimes in the soil. Humine powder – accelerates development of strong roots, improves the microflora of the soil. Helps plants to assimilate nutrients. Humines alleviate the growth stress of a plant, which arises from unfavourable growing conditions. Natural origin. Controlled release fertilizers – slow-release fertilizers cater for the need for nutrients during the season after the planting. 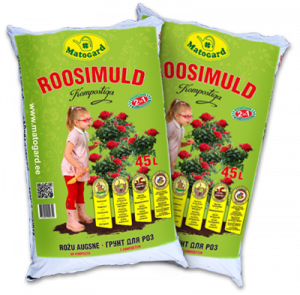 The recommended amount of rose soil during planting is 20-40 litres per one plant. If you plant separately, both the diameter and depth of a planting hole should be 40 cm. Thickness of the soil layer should be 40 cm in the planting area. Nutrients and microorganisms received from compost as well as added humins improve the biological and physical qualities of the existing growing soil for years. Plants will grow faster, roots will be stronger and plants will be full of blossoms. Plants will be more resistant to diseases and stress. You will improve the structure of the soil by adding rose soil to the growing soil.